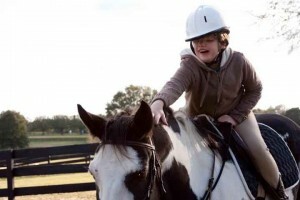 Therapeutic Riding, also known as Equine Assisted Therapy, Equine Facilitated Therapy, and Riding for the Disabled, is the use of the horse and equine-oriented activities to achieve a variety of therapeutic goals, including cognitive, physical, emotional, social, educational and behavioral goals. Therapeutic riding is practiced in some form in most countries of the world. Great Britain originally formed the Riding for the Disabled (RDA) program to promote competition and equine sports for the disabled. Today, PATH Intl. puts forward a model that incorporates therapy, education, sport and recreation/leisure activities. To read more about the benefits of therapeutic riding, click here. Would you like the become part of the Mitey Rider family? If you have a child who would benefit from Mitey Riders, click here.